Molly Huddle took control from the start of the .US National 12k and concluded her scorched earth campaign through the USATF Running Circuit. Since a last-second kick for third by Georgetown alumna Emily Infeld kept 31-year-old Huddle off the World Championships 10k podium, she has dominated the road racing scene, recording wins at 20k, 5k, 10 mile and 10k to win the domestic professional circuit. Her 38:36 finishing time for 7.45 miles gave her a 5:11 average and a 26-second win over Hall. She opened a three-second lead by the first mile and crossed 5k in 16:05, 8k in 25:49 and 10k in 32:19. She’ll take a long break until mid-March’s United Airlines NYC Half Marathon before focusing on either the 10k or 5k with an toward the Olympics. She ran the 5k in the 2012 London Olympics. Her Providence-based training group includes last year’s 12k runner up, Emily Sisson, who did not race this year. Huddle has won each of the three 12k championship races contested in Alexandria. The contract for the race ended this year and the future of the race has not yet been determined. The overall race field has grown steadily, with 1,001 finishers, up from 933 last year and 713 in the inaugural race. 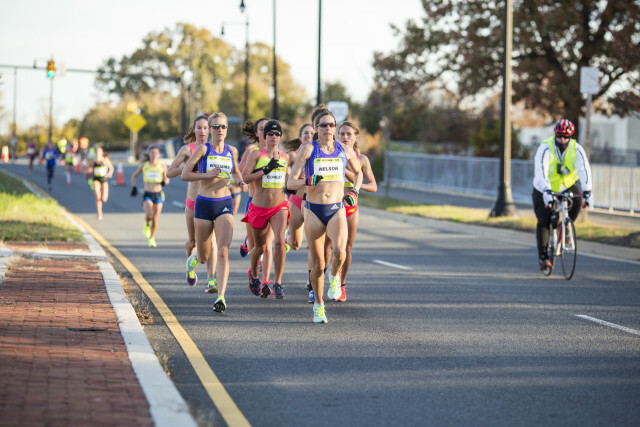 A chase pack stuck together behind Huddle on the out-and-back course on the George Washington Parkway, a change from last year when her pursuers strung out early. Williams was 11th here last year, after an injury-riddled season, and this year’s 12k comes at the end of series of successful road races. She was in the hunt for second as the chase pack neared the last mile. Though the last 1200 meters on Union Street to Oronoco Bay Park can be tricky, but kicking that early wasn’t daunting to her. Hall ultimately came out on top, invigorated in part by a the support of a cheering section assembled by a Stanford track teammate a mile from the finish. Her runner-up finish came five weeks after racing the Chicago Marathon in 2:31:14. The race went off without the chilly wind that marked the 2014 championship, which suited Hall. 41-year-old Jen Rhines set a U.S. master’s 12k record in 40:04, finishing 12th. She ran with her B.A.A. teammates for most of the race, 15 days after running 1:12:45 at the Rock ‘n’ Roll Philadelphia Half Marathon. 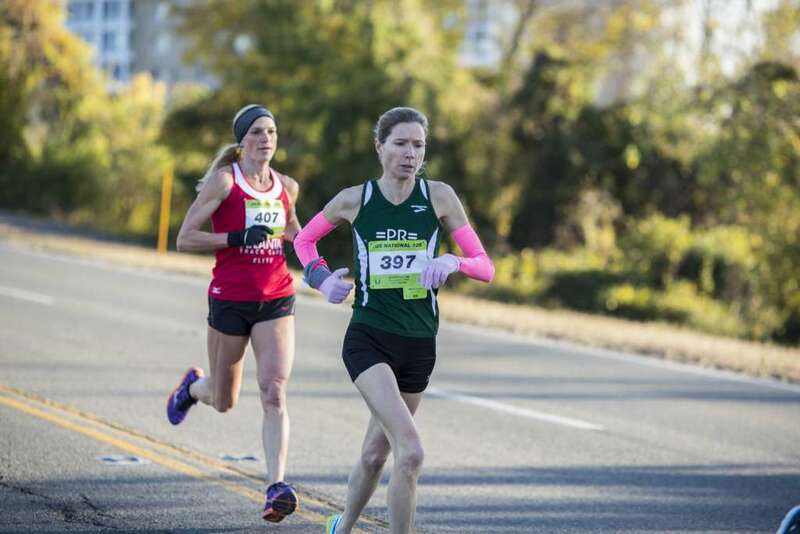 She’s taking a sabbatical from her non-running job, as a corporate accountant, to focus on preparing for the 5k and 10k at the Olympic Trials. Perry Shoemaker, of Vienna, was the top master, by virtue of Rhines’ participation in the advance start for professionals. Shoemaker’s 42:03 came as a nearly-50-second improvement over last year, representative of the Fall season she has had that also saw her finish second at the Army Ten-Miler, a finish that wildly exceeded her expectations, at 44. She was the first local woman to finish the 12k. She chalks her success up to a lot more speed work as of late. The Genesee Valley Harriers won the 40+ and 60+ national masters team titles and the Athena Track Club’s B team won the 50+, Purcellville’ Joan Hunter among the team members.